Just Released: Saying Goodbye To Vietnam is Ken's new book illustrated with over 450 photgraphs from his service as an Army photographer in 1969 and two return trips to Vietnam in 1998 and 2005. For more information, click on the "Saying Goodbye To Vietnam" button on the left. In this site you will find several Galleries, each one contains original photography in the following categories: Landscapes (Colorado and Ohio), Patriotic, Vietnam 1998 and 2005. The New Additions gallery features photographs from California, Florida, British Columbia and other areas. 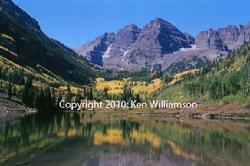 The 2010 Gallery features photos from Colorado and Maroon Bells. Pay Pal is accepted for all purchases. 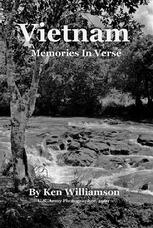 Vietnam Memories in Verse is a collection of poetry written by Ken Williamson, former Army photojournalist with the U.S. Army Engineers Construction Agency, Vietnam and the 815th Engineers in Pleiku, Vietnam. The poetry was written during Ken's return trip in 1998 to visit the places where he served and to take photographs of the same areas he had photographed in 1969. The poetry in Vietnam Memories In Verse is a result of his emotional reunion with one of the most beautiful countries in the world and his coming to grips with the war no one wanted. The photographs featured in the book are from the Central Highlands, Pleiku area of Vietnam, Engineer Hill - 1969 and 1998, Highway 19, Fire Base 7 near Dak To, Cam Ranh Bay and the Cu Chi Tunnels. Ken is an active member of The Vietnam Veterans of America and the American Society of Media Photographers. To purchase, click on the book cover photo. $14.95 plus S&H. Copyright: All images on this site are protected under the United States Copyright law. Photographs may not be copied, reproduced, printed or downloaded for any purpose without the written permission of the photographer.